I will talk in this article specifically about spiritual acceptance. If you want to read about acceptance of illness generally, please download my Ebook on the 7 stages of grief of chronic illness. Click on the book cover below to request a FREE copy. Accepting illness is the seventh of the 7 stages of grief. The 6th stage of grief is the stage of reconstruction which is not talked about on this website, but is in the free ebook. Knowing about the different stages of grief helps you to be gentle with yourself in a time of illness. Click on the book cover above to access your FREE copy of this ebook. 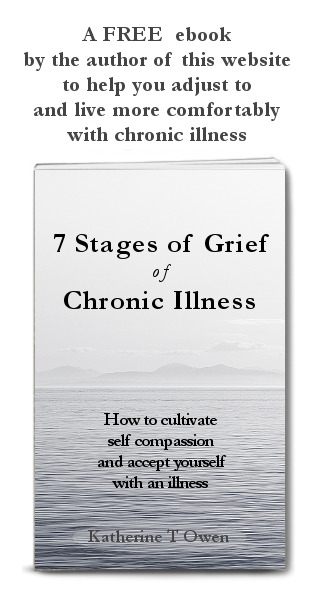 The book includes extra information to help you through the 7 stages of grief of chronic illness. This statement can be said as a prayer of acceptance. Spiritual beliefs can be of powerful assistance in helping us to accept illness. 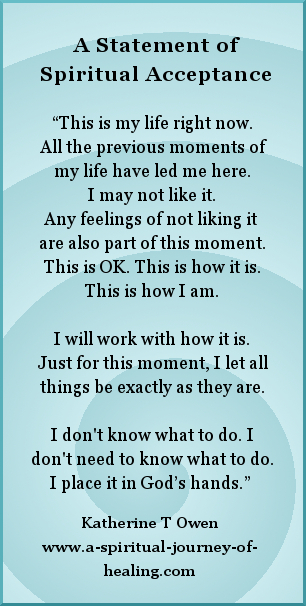 Here are some spiritual beliefs that can help people of different faiths to accept the present moment. See if any of them ring true for you. You can use the ones which speak to you as affirmations to help you to change your beliefs. I am held in the arms of a loving God who loves me where I am and leads me to the next step. God has a plan, and any suffering is incomparable to the joy I touch in those moments when I rest in God. I must have the strength to be in this situation or else God would not have led me to it, or I would not have chosen it. Karma– This experience balances out an experience from a previous lifetime. As I accept it I am burning off karma. As a result, when I die I will be reincarnated into a more favourable life. The Buddhist belief: I chose my parents and life circumstances before I took on this current lifetime. All things are as I chose them to be according to my strengths and according to my desire to learn and to have certain experiences. The good passes, but so too does the bad. If you want some more encouragement to persevere with going through grief to a place of acceptance and hope, click on Encouragement Poem: The Tortoise and The Hare. I had very severe Myalgic Encephelomyelitis for such a very long time - I was bedbound for 14 years. It has not been a smooth journey - I cannot walk as far as I could a few years back. But I continue to move through the 7 stages of grief as I overwrite my past to create a new future. I practice spiritual acceptance of illness. I practice acceptance of the health I have. Click to collect your FREE copy of my ebook which talks more about all 7 stages of grief, including more about acceptance of illness. Thank you for reading these articles on the 7 stages of grief. Know that all the 7 stages of grief are necessary and normal. It is OK to be "going through a stage". By recognising the stage you are in, you can learn to be gentle with yourself. Let us be willing to be loved by God as we are. There is no greater place of growth than one in which we feel accepted. Wherever you are, you are doing wonderfully. As you read these articles you have been receiving validation for some of the pain you are going through. You have been saying affirmations, prayers and statements of willingness. These are all steps to help you to move through the stages of grief. If you have the motivation to read an article like this, then you definitely have the strength and motivation to keep taking the next step towards acceptance of illness. Wishing you healing both within and beyond illness. ... or acceptance of or anything you are going through!